Interested in a career working with wildlife or nature? Or perhaps a career in engineering or mathematics? Want to improve your technical skills for a future job? Join us this summer! What will participants do? We are seeking 5-7 high school students from the Eastern Band of Cherokee Indians (EBCI) for a summer research program. Students will work in Cherokee alongside researchers from the Sheldon Lab of the University of Tennessee and the EBCI Office of Fisheries and Wildlife Management to learn how to perform wildlife research through the scientific process. Participants will design and carry out a research project to examine the impacts of environmental change on species native to the Qualla Boundary. 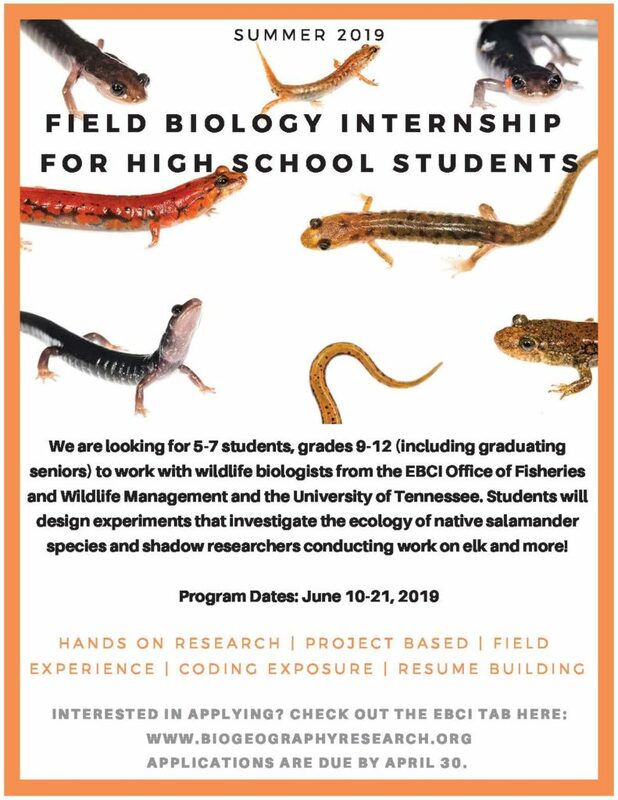 Students will also have the opportunity to shadow EBCI biologists on other research projects involving salamander conservation, bat biology, bird banding, fish conservation, and elk management. The program will run from June 10-21, 2019. Students will meet with researchers on weekdays for approximately 6 hours each day. This will allow students the opportunity to participate in the program while also participating in other summer opportunities and activities. Benefits: Students will gain insight into scientific careers, obtain experience in field research, gain knowledge of wildlife of the Qualla Boundary, and learn about data collection and computer coding. The technical skills gained through this program will be excellent for building resumes and will help students launch careers in science, technology, engineering, or math. Applications should be emailed to Dr. Kimberly Sheldon at ksheldon@utk.edu no later than April 30, 2019. Questions regarding the program or application process can be directed to Dr. Kimberly Sheldon (ksheldon@utk.edu) or Dr. Caleb Hickman (calehick@nc-cherokee.com).